The holiday season and the resulting party circuit is about to descend in full force. As much as I love sitting down to a meal with good friends and good wine, I don’t always have the time to pull that together between holiday shopping, decorating, wrapping, cookie baking and a little thing called work. General holiday stress takes a lot out of me and there’s not a lot of time or energy left to pull together fancy eats for a party. So why not put together a few tasty appetizers that are impressive and most importantly can be done ahead? A few tasty nibbles and a nice, cold glass of bubbly makes for quite a party. “Small plates” are popular for a reason. I have a real soft spot for delicious little bites and have endless notes in various binders and tagged pages in cookbooks of past favorites and interesting things waiting to be tried. In fact looking back through the archives, I realized I have some good recipes right here that would fit the bill – easily, delicious and impressive things that you should most certainly try. Best of all, most can be done ahead of time because really, who wants to be scrambling at the last minute? There you go … these six delicious items plus the one I’m posting today would make for one helluva party. Let me know what time I should arrive. So let’s discuss today’s installment, shall we? It is certain to be a tasty addition to your holiday repetorie and one I’ve made a lot but had forgotten. 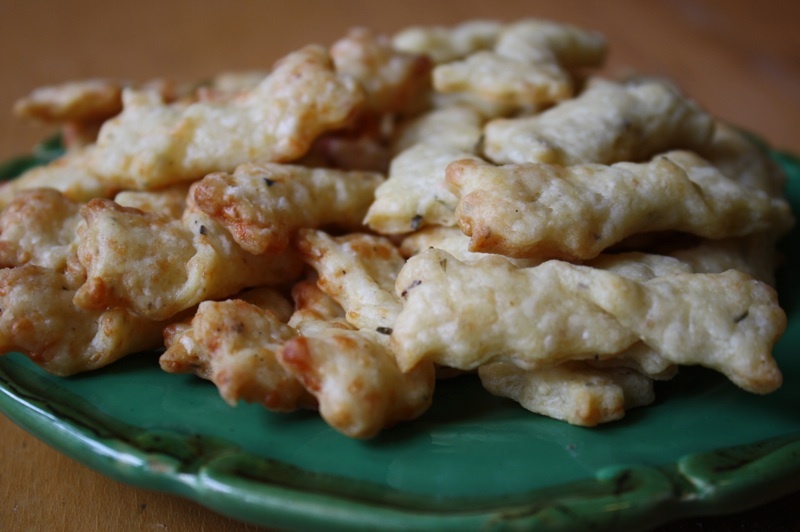 Not long ago, I grabbed my beat-up recipe notebook and a grease-stained piece of paper for “Southern Cheese Straws” fluttered to the floor. It was something I hastily jotted down from an old issue of Gourmet, made a zillion times, stuck in the back of the notebook and promptly forgot. Looking at the tattered piece of paper, I suddenly had the urge to make them again; craving their crunchy deep cheesy flavor. What I had forgotten was how quickly and easily they came together. I have a tendency to overcomplicate things so why do the easy ones always slip my mind? I’m definitely putting these back into regular rotation and I think you should as well. They’ll make a great addition to your holiday menu – good for a nice little snack or pack them in a cute little tin for a welcome hostess gift. Another super deluxe bonus extra – the dough can be made ahead, shaped and frozen so you can bake them off as needed. In fact, I made two batches this weekend and only baked off a small portion of each, enough to photograph. The remaining doughs were tightly wrapped and frozen, ready at a moments notice for holiday emergencies. Having a batch of these ready to go in the freezer may just save your sanity. If you bake them right before the guests arrive, the house will smell terrific. Never hurts. 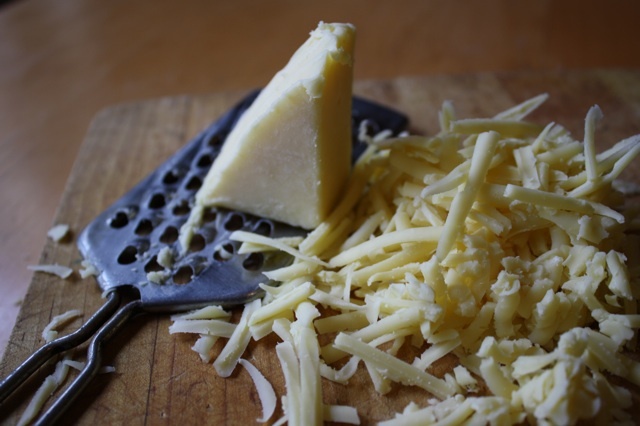 For guaranteed success, be use to sure a good quality extra-sharp cheddar. 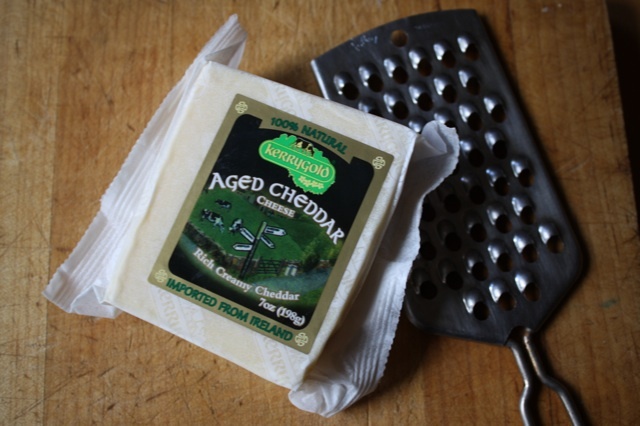 Traditionally, these are made with cheddar but use what you like; just select a firm cheese, make sure it has good assertive flavor and vary the spices accordingly. Bland cheese will make a bland cracker. This weekend I made them with Stilton, because I had some on hand (doesn’t everyone?) and they were absolutely fantastic (though they did need a little additional milk to come together.) If you don’t have a food processor, you can make these by hand, working the butter into the flour much like you’d make a pastry dough. These are similar to the Black Pepper Parmesan Crackers I’ve previously posted (and linked to above) but I think I may just prefer these. This recipe is a bit more tender, a bit flakier maybe just a touch fancier. But then again, I have been known to eat ridiculous quantities of both so there you go. STRESSCAKE BAKING THERAPY FACTOR: YES! STOCK ’EM UP! Make a few batches and have them ready to go in the freezer then bake off just before guests arrive to dazzle them with some warm, crunchy cheesy goodness. Fair warning, these are addictive – much like really really good cheez-its – so make extra because chances are very good that you’ll make a big dent in the bowl before anyone even arrives. If you don’t make extra to accommodate the inevitable munching then be sure to eat them all and destroy the evidence. Take no prisoners. Preheat oven to 350°F and line two sheetpans with parchment or Silpat mats. In the workbowl of a food processor, pulse the cheese, flour, butter, salt, cayenne and ground pepper until mixture resembles coarse meal and the butter is in small pieces. Add milk and pulse until a rough dough comes together and the mixture forms a ball. Divide the dough into two pieces and roll each out on a lightly floured surface with a lightly floured rolling pin to about 1/8” thick, about a into a 6”x5” rectangle. 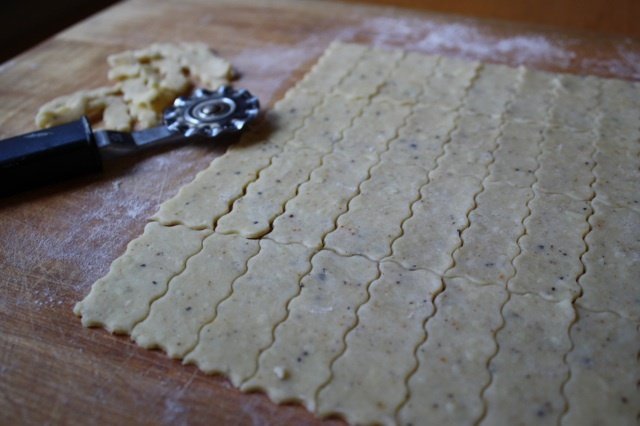 With a sharp knife, fluted pastry wheel or pizza cutter, cut the dough into ½” wide strips. Cut the strips into 1” lengths. Bake, rotating pans halfway through baking (front to back, top to bottom), until pale golden, 10-12 minutes. Cool completely on sheet pans. Store tightly wrapped up to two days.